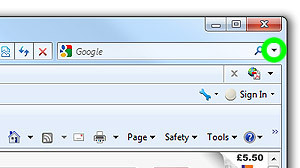 Many web browsers now support searching websites directly from a box in the main window’s menu/toolbar area. Over the years, this has developed into a standard known as OpenSearch. 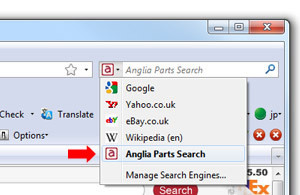 We thought it would be a good idea if you could launch our Anglia Part Number search directly from your web browser, even when you are on another website, and so we provided this small plugin. 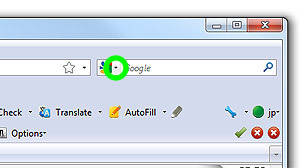 Your browser will need to be Internet Explorer 7 and higher or Firefox 2 and higher. 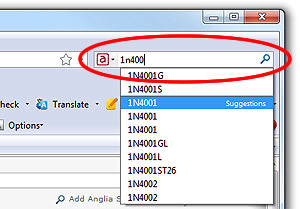 The Anglia Search Provider is now installed. You will now need to select it from the list of available search providers using the drop down arrow in the search provider located in the top right hand corner of you web browser. This is illustrated circled in green in the picture below. 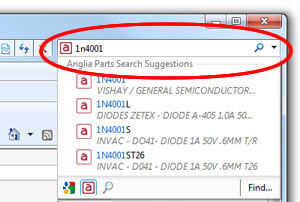 Once selected, you can type a Part Number directly into the search provider located in the top right hand corner of your web browser. This is illustrated below, circled in red. 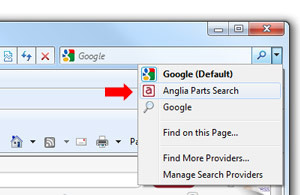 This allows you to search Anglia's range of products even when you are not on the Anglia website, providing easy access to all our parts whenever you are on the internet.